This information sheet clearly explains what is and is not matter. It focuses on what are examples of matter and that matter is made of atoms. The examples of non matter are outer space, fire and light. The worksheet reviews this concept and the quiz can assess the student's mastery. Both the quiz and worksheet are all yes/no questions. 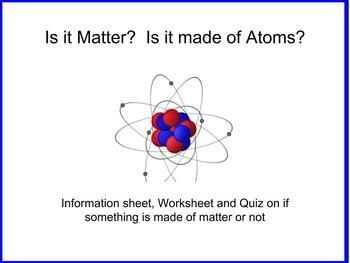 We would put the information sheet in a sheet protector and review it often before starting new lesson on atoms, matter or elements as a warm up. All visuals were found using the search engine filter; free for commercial use with and with out modification.